"no one leaves home unless home is the mouth of a shark. you only run for the border when you see the whole city running as well." Sometimes we have to step out into the unknown, moving out of bad places. Sometimes we have to run in the middle of the night like our life depends on it. When I was seeking refuge, a friend of a friend offered my daughter and I sanctuary in the form of her spare bedroom. To be frank, we’d only met once through a mutual friend. I worried this compassionate person, had no clue what she was signing up for. It was late November and unseasonably cold the day we moved in. "Day" meaning it was close to 1 am when she opened her doors to me because I had to flee when no one was watching. Walking in with my kid in tow and 4 large bags on my shoulder, basically my entire life. She smiled at me and showed me where I could put my things. As I walked away, my daughter, young at the time, stood there staring at the woman. Tal (her nickname) our savior in more ways than she’ll ever know. “I like your scarf” my little girl said, running her hand over Tal’s head covered in a bright yellow hijab. My daughter fascinated by a head scarf that reminded her of a princess. I apologized, Tal told me not to worry with the same welcoming smile she’d greeted me with when we walked in. Me, a relative stranger, other than our one connection. Me, an unknown seeking refuge at her doorstep. Tal offered her home to us for the 2 weeks it took me to find my own place. I was a new found single mother trying to find my way out of the crossroads of separation. Each day we had dinner together and I learned more about her life and she more about mine. I'd leave with an understanding of the difficulties they faced trying to get visas to come to here. The hurdles they jumped through to prove they belonged. Tal and her mother left everything behind seeking a better life in America. Immediately I could relate, as I'd left everything behind for a better life on my own. I remember asking her if she'd found that, a better life here in America. “Life without freedom is death, in America we found freedom” was all she said, and we just left it at that. Like I said, we stayed with Tal for about 2 weeks, maybe longer, I can't remember. What I remember the most was the dinners we shared each night at her little table. My daughter, Tal and I. Each day she'd asked if she could pray for me, pray that I’d be at peace going forward. I would sit there, just listening as the power of words I didn't understand washed over me. I’m at peace, mostly because of the people I surround myself with. I'm at peace because when left with nothing, running in the middle of the night away from a bad relationship, a stranger offered my daughter and I sanctuary. When I showed up a Tal's door, she held it open, told me where to put my bags and that there was dinner on the stove. We ate a hot pot of this stew with spiced cabbage and some fried dumplings called Mantu. I should've made that for this post. But I remember crying into that bowl of stew. Wondering what would happen to me and my kid. Wondering how I would be able move forward. There is no feeling like the feeling of hopelessness. To feel as though you have no where to go and no one to take you in. To feel as though you have no freedom. There are a multitude of organizations out here fighting to hold the doors open and offer refuge to those in need. I encourage you to find the one that's local to your area and ask them how you can be of service. no one puts their children in a boat unless the water is safer than the land. " I'll leave with a pray for peace going forward. For protection of my refugee and mulism brothers and sisters. For protection for my black and brown brothers and sisters. For the woman who's rights are beinging determined by others. For my LGBT brothers and sisters who deserve to be who they are and love who they love. For protection against any evil that may come down from the sky or rise up to it. Any evil that may be planted in the earth or spring forth from it. 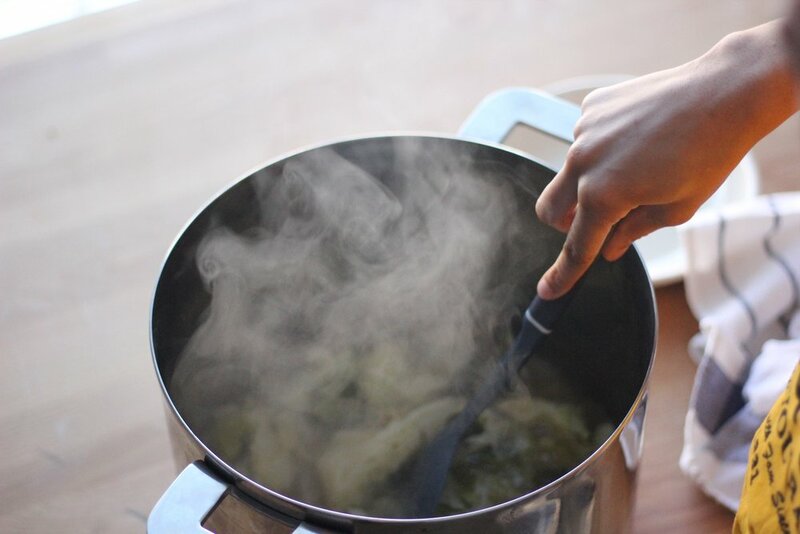 Directions: In a medium or large stock pot, heat the olive oil over medium high heat until hot. Add in the sliced onion and sauté in the olive oil, until the onion slices are tender, about 5 to7 minutes. Add in the chicken stock, vinegar, and collard greens. Sprinkle with salt, black pepper, to taste. Then add the crushed red pepper; cook, stirring occasionally for 20 minutes. Add in the chopped cabbage leaves, and cover, stirring occasionally, allow ingredients to cook until cabbage is almost tender, for about 15 more minutes. Allow to cool slightly before serving. Potato Leek Soup with Pancetta "Croutons"